The religious phenomenon of the Counter-Reformation, in the 17th century, was artistically expressed by the dramatic Baroque style. Rome owes its Baroque aspect of today to the 17th–century popes Urban VIII, Innocent X, and Alexander VII, who became patrons of the greatest exponents of this style, such as Gianlorenzo Bernini and Francesco Borromini. The work of the two baroque architects was to give a large contribute to the outlook of the city, notably embellished by precious fountains, palaces, villas, parks, and other important constructions. In particular, Bernini designed many elegant fountains, the most elaborate of which is located in Piazza Navona. Borromini built the courtyard of Palazzo della Sapienza, San Carlo alle quattro Fontane, the church and Dome of Sant'Ivo, Sant'Agnese in Agone, and the Oratorio dei Filippini. The flamboyant staircase beneath Trinità dei Monti, the Spanish Steps, and the famous Fontana di Trevi date back to the 18th century, characterized by the Grand Tour of the wealthy young men from Britain, who came to Rome to complete their education by admiring Roman's classical remains. Though it counted only 150,000 inhabitants, at this time Rome came to be regarded as a centre of European culture. 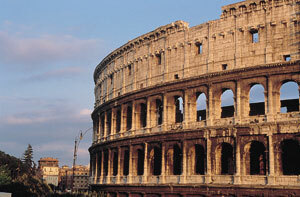 During the 19th century Rome underwent a period of great changes. In 1798 the French enetered the city, captured the Pope Pius VI, and proclaimed a republic. In 1809 Napoleon annexed the States of the Church, already diminished, to the French Empire. In 1810 the French Senate proclaimed Rome as second capital, and in 1811 Napoleon conferred the title of King of Rome to his newborn son. The invasion of Napoleon, in 1797, notably damaged lots of cities in Italy, not only politically but also from an artistic point of view because he used to appropriate many art treasures and bring them to France. Even Rome was artistically sacked by Napoleon and suffered the loss of many works of art. During the reign of Napoleon, the popes lost their political power, rescued again only after the Congress of Vienna, in 1815.